Now that the Easter bank holidays are out of the way, attention can switch to the summer and we’re helping you get in the mood with an exciting offer for your staff engagement event. For any session booked before the end of May we’re offering 25% off. The session can be tailored to your needs but are great for inter-department competitions or as team building activities with smaller groups. 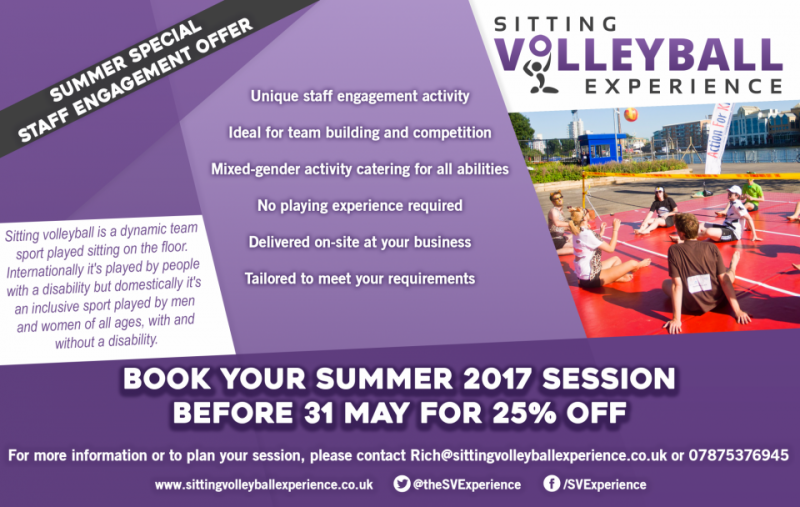 Sitting volleyball sessions are ideal in that everyone can play. The sport is mixed-gender and no experience is required. As a sport that few people have played, everyone will be as good (or as bad) as each other!